(TibetanReview.net, Dec02, 2016) – China is reported to have extended for the sixth successive year a highly intrusive surveillance programme that targets each Tibetan across the so-called autonomous region of Tibet (TAR) for scrutiny, education and tests of loyalty to the Communist Party of China (CPC) and the Chinese nation ruled by it. The programme involves sending tens of thousands of CPC and government cadres to thousands of villages, religious institutions and neighbourhood committees across rural TAR to monitor and surveil local Tibetans, organise anti-Dalai Lama-themed political indoctrination campaigns, and entrench and expand the influence of the CPC in the region, said Dharamshala-based Tibetan centre for Human Rights and Democracy Nov 30. 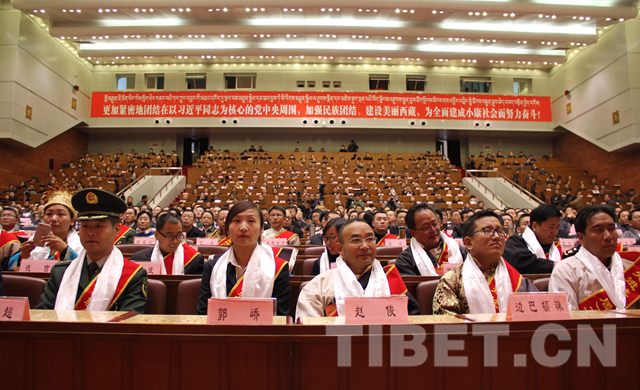 The report cited official Chinese media as saying Nov 25 that the sixth batch of “village-based cadre teams” (Chinese: zhucun gongzuodui) had been announced at a conference in Tibet’s capital Lhasa “recently”. During the conference awards were presented to cadres in the previous fifth batch for ‘outstanding achievement’. The centre said the sixth batch of ‘village-based cadres’ consists of a total of 22,000 party and government cadres. Of them, 2,408 were provincial-level cadres while 55 were prefectural-level cadres. These leaders will lead and direct the rest of the cadres. The resident cadres will be stationed in the TAR’s 5,467 villages and neighbourhood committees, besides in the religious institutions as well. The centre said China began implementing this campaign in Oct 2011 with a design to ‘nip in the bud’ any sign of dissent against and criticism of the Chinese rule so as to prevent a repeat of anything life the 2008 Tibetan uprising. China uses the euphemism of ‘Solidify the Foundation, Benefit the Masses’ (qianji huimin) to describe the campaign, which is in fact nothing more than a monitoring, surveillance and intimidation campaign. When first launched, China said the campaign will last for three years. However in Dec 2014, the TAR authorities made it clear the campaign will continue indefinitely with the aim to “consolidate and expand the excellent initial results”. Under the campaign, Chinese cadres can freely enter any Tibetan home any time they want, ask questions designed to test political views and loyalty as well as to demand any other information, and order residents to attend political education meetings. In the urban areas of the TAR, China implements what it calls the Grid Management campaign with the same objective and level of intrusiveness. The centre said China also implements stability maintenance (weiwen’) policies in the Tibetan areas in Sichuan, Qinghai, and Gansu Provinces. In the TAR, six types of stability maintenance measures were carried out during the tenure of former party secretary Chen Quanguo, namely 1) grid management; 2) convenience police posts (bian minjing wu zhan); 3) stationing cadres in religious institutions; 4) village-based cadre teams; 5) introduction of biometric national ID cards; 6) double-linked households. Under the stability maintenance campaign’s basic programme of ‘double-linked households’, also known as “pairing up and finding kin”, party cadres are required to befriend and guide poor families in adopting the correct attitude and towards getting rich.